For the first time since 2008 (when I raced in the Advanced Solstice) I am in the hunt for an overall series win in iRacing. 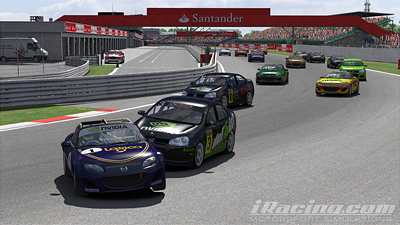 Racing in the multiclass Grand Touring Cup series I have been racing the MX5 against the often faster Jetta cars and have been picking up some good results which has me in a very strong shape for a top three finish when the season finishes in a month or so. So it was with regret that a vital Silverstone race during week 9 resulted in a messy lap 3 wreck that saw my position tumble from the class pole position all the way down to 13th in my class (20th overall), and firmly last. Realising that the Jetta drivers always have a powerful launch against the under-powered MX5 cars I tried to signal my intent to take the inside line for the first right hander at Silverstone (directing faster Jettas to pass on my left) but it seems this wasn’t received by the Jetta behind, as he put us three wide going into a fast turn 1. A moment later, another car clipped my rear quarter panel sending me into a spin and out into the weeds. I was seeing red as I had been looking at a strong win (I was on class pole, and had a clear pace advantage over the second place runner) so with a tight grip on my wheel I set about seeing how far I could catch up. After half a lap of frantic driving I was surprised to see that the class leader hadn’t been able to scutter into the distance (the erratic Jettas around him had seen to that) and I was only around five seconds back, albeit with several hard racing cars in between. I did my best to dice through the field and eventually fought my way to second place, on lap 4 of 19. I was five seconds back, and around 1-2 tenths faster per lap than the leader. It would be tough. Racing hard, I had some success and managed to slowly claw my way back within two seconds with a few laps to go, but it was not to be as a rogue Jetta (one lap down and in 15th place no less) had caught up to me and started racing me (for no gain to his race as he was far far back from his next competitor). His wild moves and general disarray slowed my progress and allowed my race rival to trot into the distance uncontested in some nice clear air. Had I been able to convert this mess into a win it would surely have been my greatest victory in iRacing, but as it was it remains just one interesting event and a reminder of what could have been. Here’s a short race highlights clip of the initial spin and mission to get back through the field.